What looks to be Dublin’s first stationless bicycle share has now gone public with a brand, website, app and launch date of July 2017. It is set to cost €1 per rental, without a subscription cost. While it is known that a number of stationless or dock-less bicycle share offerings are looking to launch in Dublin, Bleeperbike has gone public with bleeperbike.com and on its Twitter account it said it is “Launching July 2017”. Its website states that a €5 top-up will get users 5 rental, and €25 top-up gets 27 rental. A rental is up to 1 hour. Users of iPhone or Android phones will be able to use their phones to unlock the bicycles, a Windows phone option is not yet ready. 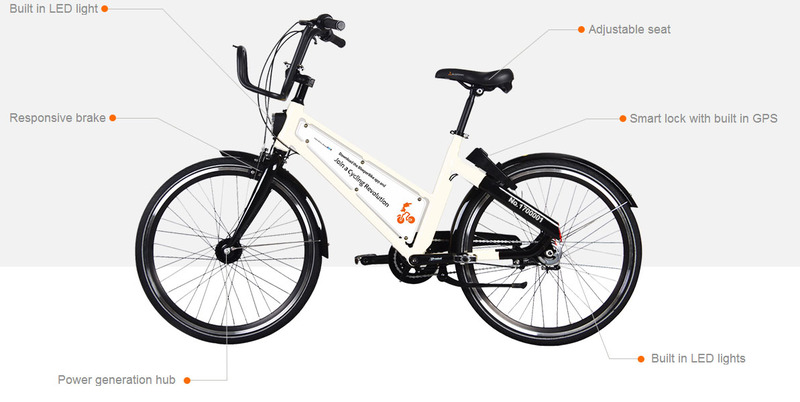 The Bleeperbike seems to be largely based on the same bicycles and systems as yobike.co.uk, which said it has “chosen Bristol as its European launchpad”. YoBike describes itself as “the brainchild of Chinese tech entrepreneur Bin Wang”. However, so-far Bleeperbike does not have different pricing options available with YoBike, such as a £5 Day Pass for 24 hour access, or a £39 Annual Commuter Pass which includes two one hour trips per day. It is understood that the Dublin system could include up to 1,000 bicycles and the operation has a depot in Portobello. A reader captured the above image of four of the bikes left on kickstands along the Grand Canal near Portobello, and the system’s app shows most of the bikes in the depot. It is unclear at the time of writing if any of the bikes are available to hire. IMAGE: Bleeperbike has lights, mudguards, and racks rather than a front basket. Bleeperbike uses rules and a scoring system to attempt to get around the stationless bicycle share problem encountered in China and elsewhere where bicycle share bikes are abandoned outside train stations and apartment blocks. Each user starts with 100 points and gains one point for each ride, for reporting a broken bike, reporting a incorrectly parked bicycle, and inviting a friend to use the system. Users with higher points will receive free rides. The photo guide on bleeperbike.com indicates bicycles should only be locked to official on-street bicycle parking such as bicycle racks and CycleHoops. Railing and polls without CycleHoops attached should not be used. Restricting parking to already over-subscribed official parking may cause its own problems. In a report to the Dublin City Council transport committee in April, Edel Kelly, a senior planner at the environment and transport section of Dublin City Council said: “Stationless bike share schemes are on their way to Dublin. The City Council needs to be proactive in engaging with potential operators in order to ensure that the city can benefit from these schemes and manage the potential impacts. “The pilot should also explore the potential for these schemes to complement the DublinBikes scheme and to serve areas outside of the city centre. It is recommended that a competitive technical dialogue be initiated to procure a pilot for the city,” said Kelly. We’ll report more on bicycle share as we get it. IMAGE: Thanks to Shane Hogan. NOTE: Extra information was added to this article, mainly covering the link with YoBike. Fantastic news! Great if it covers Greater Dublin, rather than being limited by stations like the increasingly kludgy Dublin Bikes. This no doubt will have a good uptake especially given the inadequacies of the Dublin Bikes scheme which is long overdue for expansion. One downside here is the current availability of parking stands especially in the city centre. With all these extra bikes around it could tough finding somewhere to lock up for those of us using our own bicycles. The council really needs to rollout much more bike stands very quickly to overcome this issue. These stationless bikes are coming to Dublin and all of Europe in a BIG way over the coming months, and we in Dublin Cycling Campaign welcome the initiative, but with a note of caution in relation to potential misuse and abuse. I was just in Rathmines and all 72 (I think it is) bike parking places outside the Swan Centre were bristling with bikes. The city really needs to start putting these on side streets and corners as well as main streets. It would be interesting if the GPS location system being used to track these bikes became available to ordinary users; it would cut back bike theft immediately and drastically. Who is the largest renter of bikes in Dublin there isn’t one of these new fangled upstarts? Fantastic and congratulations for making this a possibility! Dublin – please beat expectations!!! !